IHG Rewards Club is offering up to $350 return air fare credit for staying 2 nights or more at the Venetian or Palazzo in Las Vegas between June 1 and August 31, 2014. You must register for this offer before your your stay that must be booked directly with IHG and not on the Venetian’s or Palazzo’s websites. You can access and register for this offer on IHG’s website here and then access The Venetian IHG booking page here and Palazzo’s here. A stay is qualified when paying qualifying rates, which include most business and leisure rates. Advanced Purchase room rate is not a Qualifying Rate for the Vegas Fly Back Bonus promotion. Qualifying Room Rates also do not include the following reduced room rates: net wholesale individual and group rate, certain package rates, employee discount rate, friends and family rate, crew rate, special discounted contract rates, seasonal worker/crew rate, 50% travel club discount rate, travel industry discount rate, distressed passenger rate, IHG® Rewards Club Nights/Airline Hotel Reward rate, Best Price Guarantee Free Reward rate, complimentary hotel stays and any other rates not defined as a Qualifying Room Rate. 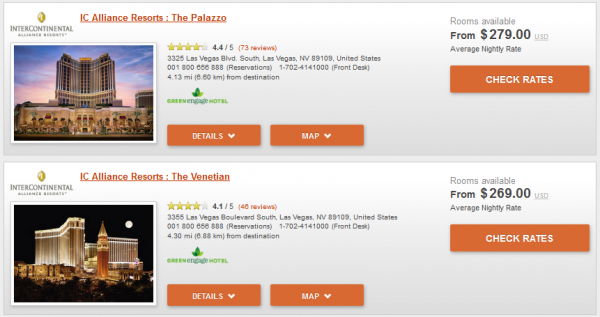 Your return trip must include a minimum stay of three nights at Venetian or Palazzo, both located in Las Vegas, Nevada. Room rate will be calculated using the regular (non-promotional) rates posted on resort’s website at the time of booking. You are responsible for the cost of transportation between the airport and the hotel. Air travel and hotel stay dates must correspond. 1.You must register your Airline Credit Award at www.ActivateAward.com before using it. Only the person named on the Airline Credit Award notification email can register it and must be the traveler. The Airline Credit Award is non-transferable. Only one Airline Credit Award can be redeemed per hotel stay. 2. Your Airline Credit Award must be registered within 30 days of date of the Award notification email. Questions regarding this Airline Credit Award should be directed to support@otbterms.com, please include your product ID and serial number. This offer sounds far better than it really is once you read through the fine print. The problem is booking the airfare (hoops) and the fact that discounted rates at the hotels are not qualifying under this offer and that you must stay at least total of 5 nights (2 on the first trip and 3 on the subsequent one). It can work for your advantage if you stay at these two properties often and can return during the first 3 months and get the full $350 airfare credit. You will receive an email to the email address you registered with, with the details of how to redeem the Airline Credit and book your second stay. Second stay must be at The Venetian or The Palazzo for at least 3 nights. 2 night minimum stay is required on the initial stay. Registration for promotion is required in advance of stay. Registration can be completed at www.ihg.com/vegasflyback. Guest must book their qualifying reservation through IHG®channels (brand websites, call centers,) to become eligible. Guests who book in any other way, including directly with The Venetian or The Palazzo, any other hotel, or online or other travel agency will not be eligible for the Award. Valid email address is required for registration. Must register on or after June 1, 2014 and book and stay a minimum of 2 nights at The Venetian® or The Palazzo®, an InterContinental Alliance® Resort on or after June 1, 2014 through August 30, 2014. Open to residents of the 48 continental United States and the District of Columbia who have attained the age of majority in the jurisdiction of their residence. 2 night minimum stay is required. A stay is defined as two consecutive nights at the same hotel, regardless of frequency of check-in/out. A stay is qualified when paying qualifying rates, which include most business and leisure rates. Advanced Purchase room rate is not a Qualifying Rate for the Vegas Fly Back Bonus promotion. Qualifying Room Rates also do not include the following reduced room rates: net wholesale individual and group rate, certain package rates, employee discount rate, friends and family rate, crew rate, special discounted contract rates, seasonal worker/crew rate, 50% travel club discount rate, travel industry discount rate, distressed passenger rate, IHG® Rewards Club Nights/Airline Hotel Reward rate, Best Price Guarantee Free Reward rate, complimentary hotel stays and any other rates not defined as a Qualifying Room Rate. Also excluded are opaque rates and “name your own price” rates (where hotel name, location and/or rate not visible until after booking is submitted). 12. ATG has no control over schedule changes, canceled or oversold flights. Remedies for these situations are at the discretion of the validating carrier and subject to federal regulations. 13. ATG has final authority on all ticketing, pricing and availability decisions. 14. Terms and conditions are subject to change. For complete, up-to-date information, please go to www.otbterms.com/flyback-IHGVP.